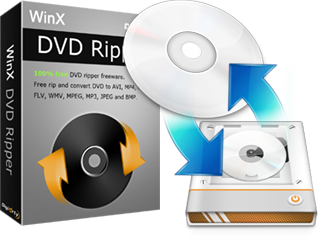 Thank you for choosing WinX DVD Ripper free download. Trusted by 5 million users worldwide since 2006, WinX DVD Ripper has been picked by countless users and editors as the best. By fully utilizing the hardware resources of your computer, this DVD ripper reaches the peak of DVD ripping speed while delivers original quality & smallest output file size. Meanwhile, it consumes mininum CPU power. Strongest for all discs: homemade/damaged/workout/99-title DVD discs, folders, ISO images. Click the button to get a hardware accelerated DVD ripper. Perfect for even low-end computers! Always the 1st to support new DVDs. Decode any DRM. DVD to MP4, MOV, iPhone, Android, ISO image, etc. Rip any old and new DVD in 5 min. Crop, Trim & Subtitle. Q: Why are there 99 titles in the DVD? It is a cat-and-mouse game. Nowadays, new released DVD apparently has 99 main titles. Common DVD ripping software can't read such kind of DVD at all. Some of them can read, but don't have the capacity to recognize the correct title. So you usually end up with a video that has no sound, mixed up video, and that is shortcut. Or the output video is out of order. Sounds familiar? You probably knew this pain if you used Handbrake, DVD shrink, Freemake and Wonder***. Q: What makes WinX DVD Ripper the strongest for 99-title DVDs? WinX DVD Ripper is built with a powerful kernel and a unique DVD title checking mechanism. It can easily find the main title from the 99 ones, just in seconds. Ripping DVD with WinX, you will get the output in any format you want, with original content and correct order. Q: Why WinX is much faster than other brands? WinX is distinguished for fast software transcoding speed, attributed to uniquely developed Super Encode Engine, Hyper-threading technology and Multi-core CPU utilization. Its latest version supports Hardware Acceleration. It means that Intel QSV and Nvidia (CUDA) Nvenc on user's computer can be utilized to maximally accelerate DVD conversion process. Q: WinX supports Main Title Content Copy and Full Title Copy. What is the difference and which one should I choose? Main Title Content Copy helps you copy and save selected Audio, Video and Subtitle track to hard drive. Full Title Copy is to back up all Audios, Videos and Subtitles. So it depends on your purpose. Q: I found many "top DVD rippers" articles in the internet. After testing, I found that those "top" were not true! If you read carefully, you may find that some "top" articles were written years ago. It's likely that part of those "top DVD rippers" were not updated for years. While some new articles list "all" known DVD rippers without real test and in-depth evaluation. 1)	visit the official sites of those products and check whether the sites and products are updated continuously. 2) check whether the download links and setup files are safe with some online tools before you put it in your computer. 3)	cancel the installation once you notice the product forces you to install third-party application. 4)	test with anti-virus tool on. 5)	test with not-so-important DVD disc first. * Please check your local laws and rip DVD for fair use! If you don't own the DVD, don't do it. If you do own it, think before you rip.